From avant-garde architecture to outdoor pursuits and culinary delights, this area of northern Spain is a traveller’s paradise, discovers Sarah Jane Evans MW, who shares her Rioja travel guide. The hills soon turn to mountains, for Rioja runs west to east along the River Ebro, and is bounded on the north by the Sierra de Cantabria, and to the south by the Sierra de la Demanda and the Sierra de Cameros. Through the middle runs the Ebro. The result is a wonderfully craggy landscape where snow can linger in the background quite late in the season, while along the river plains the vines bask in the sun. The Romans found the local Celtiberi peoples already making wine when they arrived. Rioja is a region that wears its history lightly, yet in the hills and the smallest villages there are traces from every period of settler, from the Neolithic to the Moorish and Medieval. 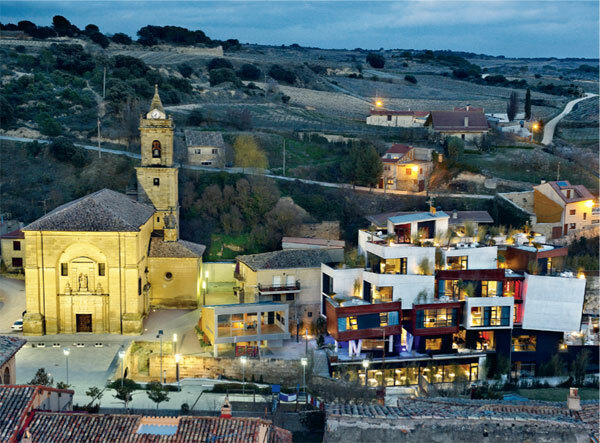 In fact, it’s perfectly possible to spend a week in Rioja revelling in the countryside without visiting a single winery. For the energetic there is paragliding and skiing, walking of every level of difficulty, bird-watching in national parks, and there are dinosaur footprints to find and bicycles to rent. For the more contemplative, the Unesco world heritage sites of the monasteries of Suso and Yuso in San Millán de la Cogolla demand a detour. It was at Yuso that the first words were written in Castilian Spanish about wine. One set of travellers passing through who do usually press on without spending time at the wineries are the pilgrims. They are following one of the historic roads to Santiago de Compostela in the far northwest of Spain, in honour of St James. Logroño, the capital of the region, is a meeting place for two of the routes – one of them the much-trodden path through France. Most of the pilgrims are easy to spot, walking with backpacks in pairs or small groups, staff in hand. Today not every pilgrim travels on foot – there are mountain bikers who don’t have so much time to set aside. Nevertheless it’s hard to avoid the wineries, some 1,200 of them at last count, for the region has sprouted a rash of glossy designs, of which the most famous is Santiago Calatrava’s undulating Ysios. Until the economic collapse, a bodega was a favourite indulgence of the seriously rich. Today the passengers flying into Bilbao are much more likely to be dark-suited bankers arranging quick sales and rescue funding for collapsed projects than the one-time flurry of international architects. Every successful trip should start at Haro – the closest of the cities to Bilbao – where Rioja blossomed in the late 19th century. Then move on to Logroño, being sure to leave plenty of time on the way for a walk around the old centre of the fortified hill town of Laguardia. Logroño offers plenty of culinary delights but there is no chance of going hungry anywhere in Rioja. Meal times may be late – lunch at 3pm, dinner at 10pm – but it’s still possible to find authentic, local foods all across the region. By rights the meals should be a vegetarian’s delight: there’s fat white asparagus, brilliant red peppers bursting with stuffings, multi-coloured menestra – a stew of seasonal vegetables, mushrooms of every type in their season, and potatoes in every form, from golden chips to golden tortillas espanolas, to spicy with chorizo. Chorizo, though, is the warning sign for vegetarians – the flavour of so many dishes is lifted or spiced with this sausage, or jamón (ham), and one of the great pleasures of a trip to Rioja is meat-eating. A favourite is smoky, crispy chuletillas, little cutlets of milk-fed lamb, held in the fingers and gnawed off the bone, served with a fresh, fruity crianza. Eating is an occasion where it is worth knowing a few words of Spanish – it makes all the difference to be able to ask about the different tapas, or to talk to stallholders at the abundant Mercado de San Blas, Logroño’s market, or local shopkeepers – especially if you are tempted to buy a whole jamón. Remember that many places can shrink wrap cheeses and ham for your trip home. A crisp winter morning, with snow on the mountains and blue skies overhead is hard to beat. Yet in the spring, the green countryside and the new season’s lamb and vegetables are a lure. Summer is hot, so locate a hotel with a swimming pool. Autumn brings the wine festival, but wineries may be too busy to welcome visitors properly. Late autumn – if there’s no rain forecast – can be the most pleasant of all. Heathrow, Easyjet flies direct from Stansted. Flying time is about 2 hours. 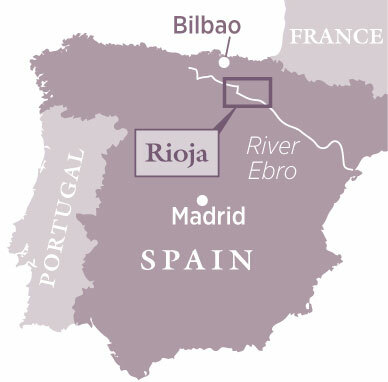 The easiest way to then reach Rioja is to drive; Haro is 130km south of Bilbao.